You can’t help but notice a big, white, collegiate-style M emblazoned on the mountainside northeast of Bozeman. The M stands for Montana State University. Whether or not you cotton to the western tradition of posting white rock monograms on the sides of mountains (here’s an article that tells about their history), hiking to the M is a great way to dip your toe into hiking around Bozeman. Another thing that makes the M hike so popular is that its 3 mile loop is long enough to feel like you did something, but short enough to squeeze a walk in before or after work, on a lunch hour, or at sunset. 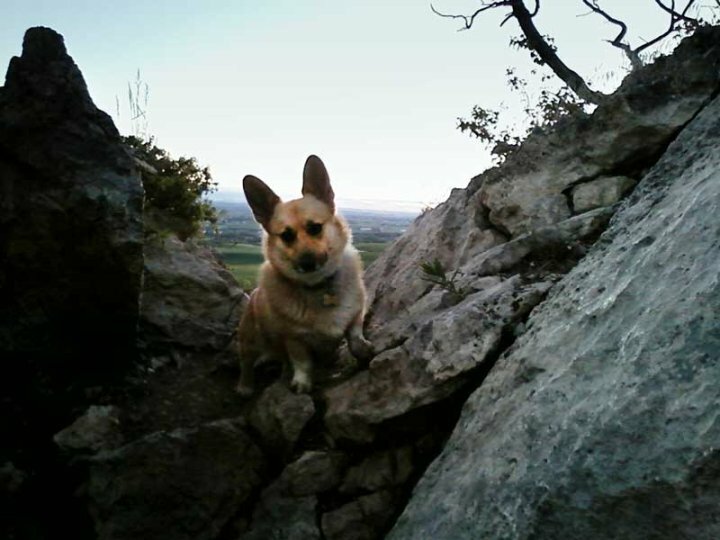 It’s also super close to town, (here’s the location of the M trailhead) so the M trail is Bozeman’s unofficial open air gym, shared by everybody and their dog. And, in spite of a few piles of dog-doo* and the certainty that you’ll see other hikers, it’s pleasant enough that you’ll probably want to do it again. The trail is open year round, (it does get muddy at times… and in winter extra traction, such as Yak Trax can make the hike more enjoyable). *There are FREE dog-doo bags at the base of the trail, which means that the not-picker-uppers are extra lame. There are three main routes to the M, with a few variations. 1. Hardest/Fastest: If you’re in a hurry and in good shape, take the right fork at the first chance you get for steep switchbacks straight up the mountain. This route is fully exposed, so you won’t be seeing much shade or vegetation, and it’s rocky, so shoes with good traction help. People can get up and down this in less than an hour, but not if they’re me! I prefer the more scenic, less strenuous routes. When you head into the forested area, there's a switchback to the left that offers a more gentle ascent. On the easy route, after you traverse the open hillside, you'll start heading across the mountain, toward the M.2. Easiest: If you want to take your time and enjoy the walk, take the left fork, and keep left on all of the forks (EXCEPT the Bridger Foothills trail, which doesn't lead to the M!). 2. 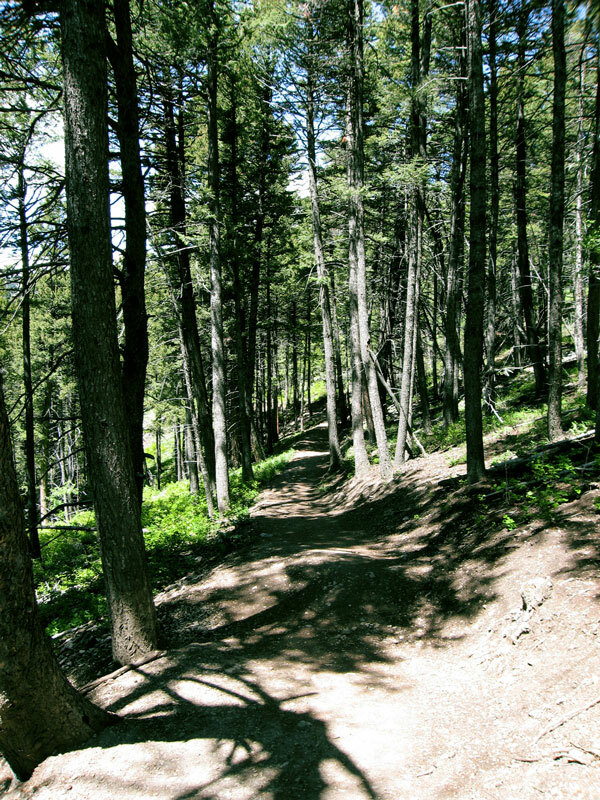 Easiest: If you want to take your time and enjoy the scenery, bear left at the base of the trail, and at every fork you come to (except for the Bridger Foothills trail, which does not go to the M). Even this “easiest” option is relatively steep at first, but becomes more gentle after the first quarter mile or so. People often ask “Am I halfway yet?” They’re usually not! But there are benches at vistas along the way, so no need to rush yourself. If you’re not game for the whole loop for whatever reason, just seeing the valley from the first bench is worth the trip. On the easy route, you’ll begin with some switchbacks through wooded foothills and just when you reach an open hillside, you’ll see a sign that offers a shortcut. For the easiest hike, don’t take the shortcut. At the halfway point, you’ll see the sign for Bridger Foothills trail: DO NOT take the Bridger Foothills Trail. It doesn’t go to the M.
It usually takes me around 1.5 hours to go up and back, but I am S-L-O-W! I got over the embarrassment of having toddlers and 90-year-olds pass me on the trail years ago. Some people run the whole way up and back, which shortens the time to less than an hour. 3. My favorite scenic route (the shortcut route): I like to take the “easy” route by bearing left at the first fork at the beginning of the trail, then take the first shortcut (labeled “SHORTCUT”) to the right. This route leads right over and through some big, cool rocks that jut up out of the hillside. There’s one short stretch of rock along the way that’s a little scrambly, so I wouldn’t take a small child or a person who isn’t confident with their balance on this route, and I’d want shoes with decent traction. As you go over the rocks, keep to the right and you’ll pass right through a little nook just like in Land of the Lost (no dinosaurs, though). Past the rocks, look back for my favorite view of Bozeman, framed by pines and rocks. The last few switchbacks through the forest are steep on this shortcut, so it’s not what I’d call easy, unless you’re in good shape. 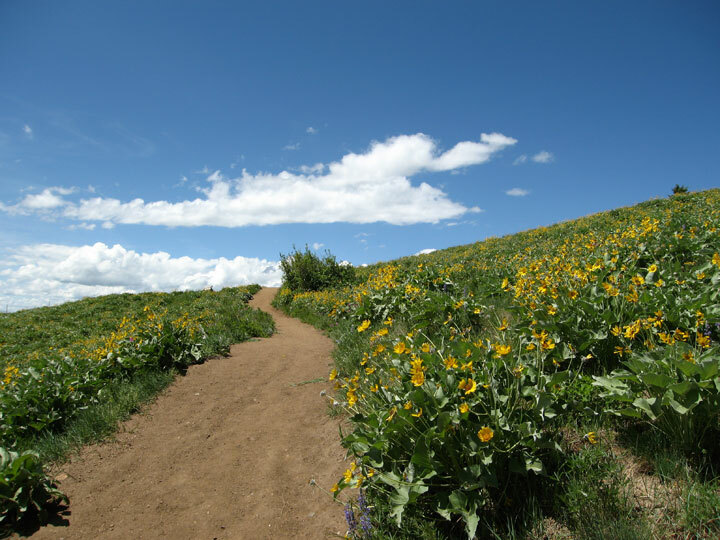 I like to return by the easy route so I don’t miss the wildflowers and the leisurely walk down and around the exposed hillside. If you’re ambitious, the trail continues up beyond the M to the ridge (don’t bring Granny unless she’s extraordinarily athletic). After you reach the ridge, the trail continues 20 miles along the Bridgers — not an afternoon jaunt! 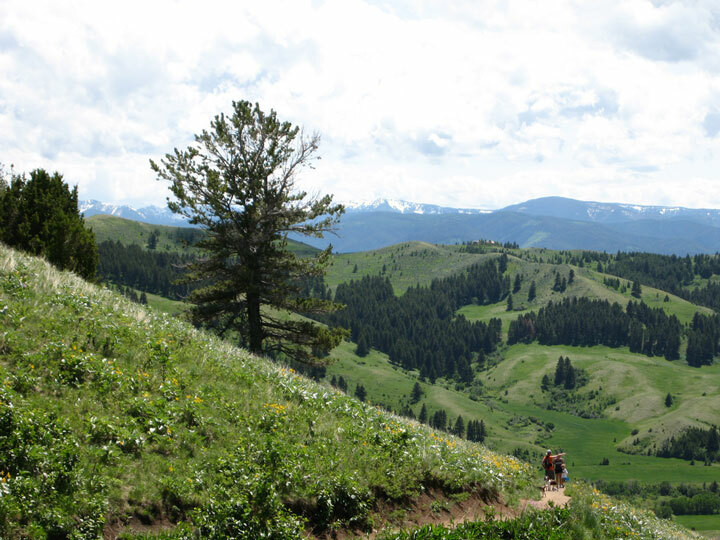 But if you are kinda nuts, you can look into signing up for the Bridger Ridge Run, where total hardcores (and I don’t use that term lightly) run the entire 20-mile ridge, from Fairy Lake to the M.
Wally and I will stick with our 1.5 hour version of the M loop. See you there!